or send us an e-mail at Darrel@ColesClassicCars.com. A classic wedding car is the very definition of style and elegance, adding excitement and glamour to your first moments as husband and wife. When selecting a car for your wedding, you will want to keep in mind factors such as interior space, air conditioning, and color. Color is usually important to most brides who will be looking for an effective contrast between the car and dress, making the dress stand out in your photographs. For a traditional or retro-themed wedding, a classic wedding car can be the piece de resistance that makes your day memorable and your photographs unforgettable. 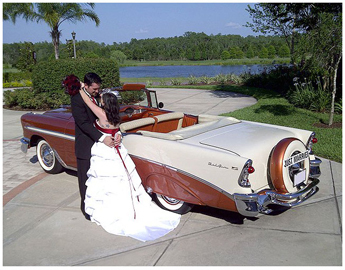 Please take a look at the classic cars we have available for your Central Florida wedding. 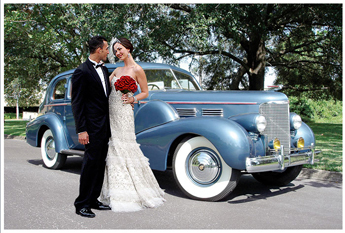 1938 Cadillac: This perfect wedding vehicle is all original in a shimmering shade of Chantel Blue. It is a very rare 1938 Cadillac Fleetwood Flat Head V-8, one of the sought-after Formal Sedans produced in 1938 at the ultimate height of pre-war styling. It is the largest vehicle in our collection and the ideal choice for your classic wedding car. The long rounded fenders and dual side mounts make this a true classic. The spacious and elegantly appointed back seat is upholstered in rich black velour, offering a beautiful backdrop for wedding photos. 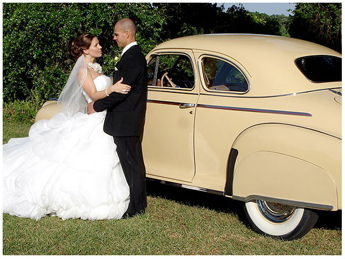 1941 Chevrolet Special Deluxe: If you are looking for a boldly styled, 1940's wedding car to match a retro theme, we offer this beautiful vehicle for your consideration. The Cameo cream color matches well with many color schemes for your wedding. This car was an AACA Senior award winner in its class, perfectly restored with all of the original accessories that were made for this model. 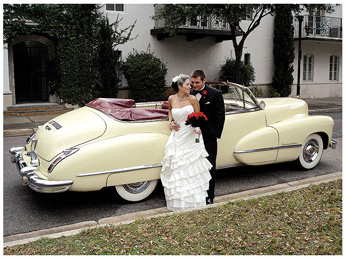 1947 Cadillac Convertible: This classically romantic light cream-colored car is our most popular choice for weddings. The interior offers plenty of legroom and the rich burgundy leather seating makes for beautiful photos with the bride and groom. Sparkling chrome and bold classic lines, make a dramatic statement every time. The top can be put up when driving to protect your wedding day hairstyle. This is one of our vehicles that is air conditioned, making it one of the preferred selections for summertime weddings. 1948 Cadillac Limousine: This Fleetwood Series 75 limo is a great choice for weddings, in classic black with bold elegant lines, and a comfortable luxurious interior that seats up to six passengers. Perfect if you want the bride and bridesmaids to arrive at the ceremony together. This car will definitely make you feel like a princess on your big day! 1956 Chevrolet Bel Air Convertible: This meticulously maintained car won the AACA Senior award, the top award for restoration. The futuristic eagle hood ornament is inspired by the 1950's fascination with space travel and aviation. The exterior color is Sierra Gold and Adobe Beige with a two-toned interior that photographs very well with the top down. 1957 Chevrolet Convertible: This lovingly restored Bel Air is also done in Sierra Gold with a two-toned interior to match the exterior paint. The 1957 Bel Air is among the most recognizable American classics of all time. 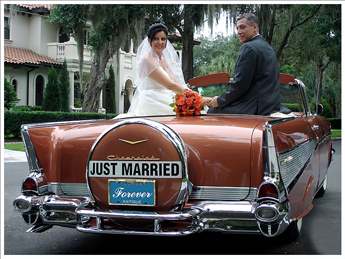 It's a popular wedding car for classic-inspired nuptials. Retro-futuristic details include the twin rocket-shaped hood ornaments, fender skirts, oversized tail fins and continental kit on the back. 1959 Cadillac Coupe deVille: This 1959 Cadillac Coupe deVille is one of the most iconic years with its outrageous tail fins and jet pod taillights. But what style she has, with her queen-size hood, beautifully detailed grille, airy glasshouse, and of course, massive in size. She is the classic image of the late-1950s American automotive design. The car is equipped with electric windows, power seats, and air conditioning for your convenience. Under the hood is the famous 390 cu. in. V-8, producing 328 horsepower for transporting this 4,800 pound car down the road. This perfect wedding vehicle is all original in a bright shade of Dover White. The spacious and elegantly appointed back seat is upholstered with rich black inserts and white leather, offering a beautiful backdrop for wedding photos. 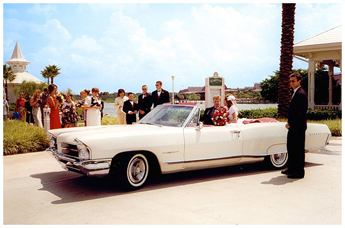 1965 Pontiac Bonneville Convertible: The 1960's are an increasingly popular era for Central Florida wedding themes, and a classic car is a must-have to add an authentic touch of 60's style to your wedding day. This classic convertible combines power with sporty styling, making it the 1965 Motor Trend Car of the Year. There is plenty of room inside for your bouffant hairdo and mod wedding dress. Inside you will find a beautiful dark red leather and vinyl interior, which contrasts nicely with the crisp white exterior paint. 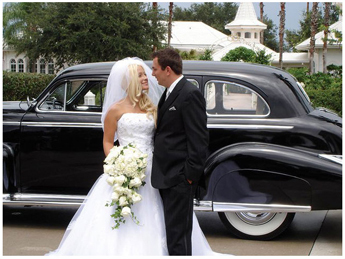 Contact Cole's Classic Cars today for more information on these classic wedding cars and others we have available. 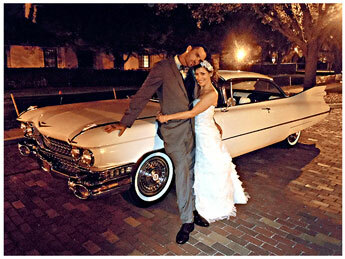 The owner, Darrel Cole, will handle your Central Florida wedding transportation plans every step of the way. It would be our honor to help you create an exquisite wedding transportation experience with memories to last a lifetime.